This unit contains 40 cards; 2 sets of alphabet ending sound cards for the following letters: a, b, c, d, f, g, i, k, l, m, s ,t, x, r (ar), v (ve), w(ow), y (ey, oy, ay). 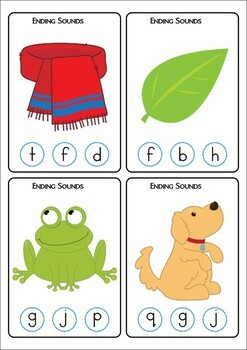 The aim of this activity is for children to correctly identify the ending sound of each picture on the cards and to clip a clothes peg on the correct letter sound. 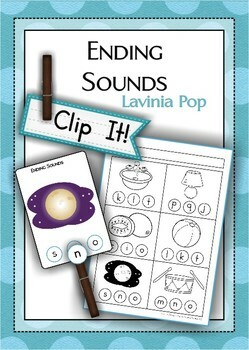 Alternatively, children can use dry-erase markers to color the correct ending sound. I have included 8 follow up worksheets that can also be used independently from this activity. 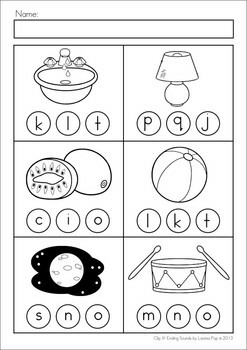 The worksheets can be completed with dot paints, ABC stickers or children can simply color the circle to show the answer. 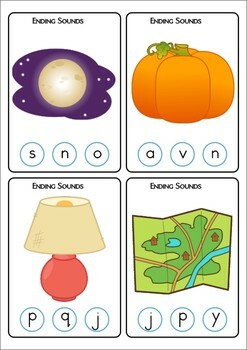 *Please note: as some of the sounds end in the letter combinations (ar, ve, ow, ey, oy, ay), I have included 2 sets of cards and worksheets for those letters: one with the letter combinations and one without. Please make sure to print only the set you wish to use.